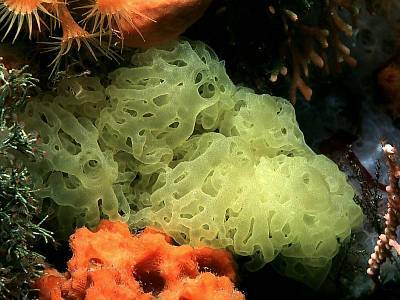 Description: This sponge consists of a bundle of yellow anastomosing tubes. The tubes form discrete groups converging on single conspicuous oscules and are typically about 3mm in diameter. Habitat: Usually out of full light, beneath overhangs or in caves. Distribution: A common Mediterranean species; the status of this species in UK waters needs investigation. Confusion of nomenclature of calcareous sponges may mean that this species has been reported in error from NE Atlantic waters. Similar Species: Clathrina coriacea is similar but consists of tubes of smaller diameter. It exists in a range of colour forms but probably not the distinctive yellow of Clathrina clathrus. Picton, B.E. & Morrow, C.C. (2016). Clathrina clathrus (Schmidt, 1864). [In] Encyclopedia of Marine Life of Britain and Ireland.